Here at ComicsAlliance, we love pretty much all things Judge Dredd (with maybe one exception). We&apos;re also admirers of the work of illustrator Ulises Farinas. As such, any combination of the two is going to pique our interests, so when we found out Farinas and colorist Ryan Hill would be teaming up with writer -- and Judge Dredd historian -- Douglas Wolk on an upcoming Judge Dredd miniseries for IDW and 2000 AD, we were intrigued. And if this early piece of promotional art is any indication, readers are in for a treat. Titled Judge Dredd Mega-City Two: City Of Courts, the miniseries features Dredd in the sprawling Mega-City Two as part of a judicial exchange program. In the Judge Dredd universe, Mega-City Two is an enormous city-state that takes up 5,000 square feet of the United States west coast, reaching into California, Oregon and Washington. It&apos;s the sister city of Mega-City One, Dredd&apos;s home, but it operates in ways that are quite different, as Dredd will soon discover. 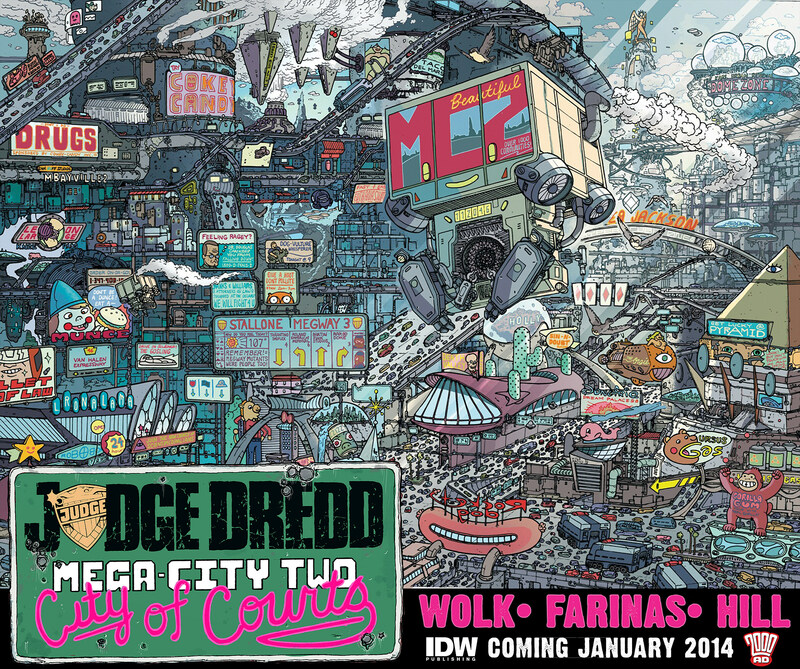 Farinas&apos; extremely detailed, busy-but-clear artistic style is perfectly suited for portraying the landscape of Mega-City Two, and Wolk&apos;s vast knowledge of the character and universe will undoubtedly lead to him making great use of Farinas&apos; particular talents. Further, Hill&apos;s coloring works incredibly well with Farinas work, bringing the proper attention to the many details that the illustrator throws into the above art, making it all pop. In short, Dredd readers will likely be very pleased. Judge Dredd Mega-City Two: City Of Courts arrives in stores in January, and IDW is offering an exclusive variant cover by Joe Corroney to readers who subscribe now.